Sorry for the long wait. In my last post I adressed the question of whether or not Captain Marvel was the definitive old school superhero comic, and I gave a quite resounding “No”. So what series did I choose, as well as lend to my friend? Rather ironically, another superhero dressed in red and yellow with a lightning bolt across his chest who gains his powers from being struck by lightning. Yup, I chose the Silver Age Flash. And…why not? I’d say the Flash meets the criteria perfectly for being the definitive old-school superhero comic. Remember, my friend didn’t want crap (pick any second-tier DC series), but he also didn’t want material that was exceptionally brilliant and groundbreaking (Eisner, Cole, early 60's Marvel stuff), because either way, neither types of series would create a good feel for the era. He wanted comics that you could just pick up and enjoy as pure escapist entertainment from the past, warts and all, and I’d say the Flash delivers that indeed. First, a little history. The Silver Age Flash’s position in the history of comics is the subject of much debate. Most DC fans credit the character with revitalizing the ailing post-code comic book industry when he debuted in 1956, as well as ushering in the Silver Age of comics. While I’m no Wertham/code apologist, one year doesn’t seem like that long a wait for an industry to be revitalized (the code was introduced in 1955), no matter how poor sales were. Also, there’s much debate over what ushered in the Silver Age, some place it as early as the 1952-4, and some place it as late as 1961 with the dawn of Marvel. And as far as revitalizing superhero comics, well, Flash might have re-popularized superhero comics, but they weren’t exactly in short supply. Superman was still doing well due to the George Reeves TV show, and while they didn’t last too long, Atlas/Timely/Marvel had a revival of their big three heroes in 1953 that lasted well into 1955, and with comics often being shipped ahead of the schedule by many months, as well as staying on the racks for long times, it wouldn’t be inconceivable for The Flash’s debut in Showcase #4 to have been sharing newsstand-space with Captain America and Sub-Mariner. Heck, it hadn’t even been more than five years since the 1940’s Flash, Jay Garrick, had been seen. Surely, someone must have remembered the character. Also, the Flash’s appearances would be sporadic until he got his own series again in 1959. Even then, you can’t say that the character was selling too well or that he had revitalized DC, since in a few years even they would credit Marvel for saving the industry. So why was the Flash so remembered? Simple, these stories are a blend of the best of Golden Age storytelling with the more streamlined storytelling of the 1950s. Carmine Infantino, who drew most of Flash’s Silver Age stories, and all of the ones in this volume, also did many of the best remembered stories featuring the character in the late 1940s. 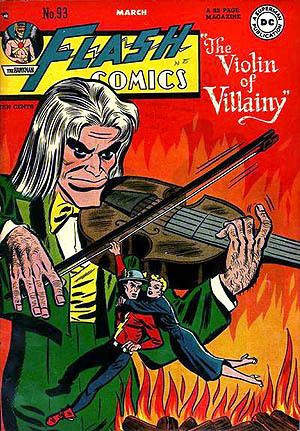 The best remembered stories from the original 40’s Flash tended to be the ones featuring super-villains like The Fiddler, Star Sapphire and The Thorn. Sadly, these best-remembered elements came fairly late in the series’ run to save it. This new series took everything good about the old one, and distilled it. Now with the old series’ best features (Infantino art and super-villains) there from the beginning; the potential of the Flash concept had finally been fully tapped. It’s like these were the stories that DC and Infantino had wanted to do all along with the original series, started doing, but then were forced to stop when sales got bad. All that built-up energy bursts out here, and thus, the new Flash series was charged with exuberance, like it was a longtime dream that had come true. Maybe it’s the romantic in me, but that’s ironically the theme of the first story! 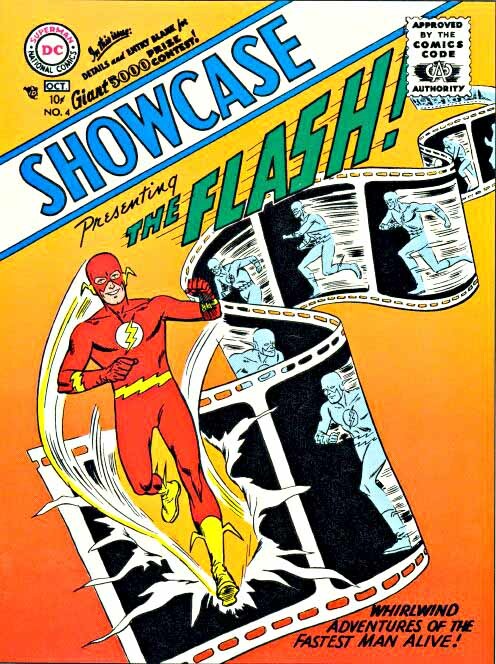 Showcase #4’s Mystery of the Human Thunderbolt (which memorably begins in media res with scientists at a radar center detecting something faster than anything on earth and being perplexed), introduces us to Barry Allen, a police scientist who spends his spare time reading old copies of Flash Comics (this was before DC was a shared universe, and well as before the whole Earth 2 debacle). After getting struck by lightning which spills chemicals on him, Barry soon finds he can run just like his comic book hero, and soon crafts himself a costume and fights a criminal mastermind named the Turtle, who, ironically, shares a name with an actual Golden Age Flash villain. The story ends with Barry saying nonchalantly “sometimes dreams come true”. And it’s that attitude which makes this story hold up. It’s easy to laugh at how Barry just gets up and walks away without seeking medical attention after being struck by lightning, or how The Turtle seems to have conveniently set traps just for the purpose of outwitting the Flash even though no one has seen Barry Allen in action at that point, but the innocence of this story makes it all palatable. It might have been better if we got to see how much Barry Allen actually idolized the Flash, when he just seems a casual reader of the comic, thus his little “dreams come true” line would have more emotional impact, but it works. Modern comics would probably set Barry up as really pathetic and at a low point so that his gaining of powers would seem like a triumph, but there’s none of that here. Modern comics would also probably play for comedy the idea of Barry Allen imitating and trying to live up to a fictional character in the real world, sort of like Walter Mitty but with power to back it up. Nevertheless, it’s fun to have an angst-free hero. It's also funny considering the mind-screw that inevitably occurs when you consider that Barry Allen is a fictional character in our world but a real one in his who gains the powers of a fictional character who is a real fictional character in our world. No wonder it was in the Flash series that the mind-screwing Earth 2 concept debuted! So, analysis aside, these comics really are just fun. They aren’t thought provoking masterpieces, just breezy light-reads, occasionally clever (the Giants of the Time-World story from Showcase #14 is actually brilliantly plotted and surreal in a Lewis Carroll meets Harlan Ellison way), occasionally lyrical (Around the World in 80 Minutes, where Flash tries to save people across the world over the course of a day, all of them coincidentally being beautiful women, is reminiscent of Will Eisner and Jack Cole at their finest), but with no goals loftier than to entertain you. That’s really all you can ask for sometimes, and that’s why I consider these comics to be definitive of the genre, they came out right between the medium’s innocence and its subsequent growing up in the 1960s, and project just the right amount of idealism with a sense of wonder. -I really like how Infantino and Kanigher seem to be trying to make the stories’ pacing match the character. Panels are often horizontal and spread across the page, giving things a streamlined look. The cynic in me wants to chalk this up to Infantino saving time by making a lot of the figures small, but it occurs too much during scenes where Flash is showing off his powers to just be a shortcut. Also, the stories read fast, man. Eisner-fast. What’s amazing is that this also doesn’t seem to be a shortcut, since the stories are all a reasonably lengthy 12 pages. Oh, and they also have time for big splash pages that depict scenes from the story. Damn. Modern writers could learn to pace stories from this. -While the stories aren’t exactly immune from silliness, indeed, there’s a great deal, the stories try and ground themselves in their own logic. Barry learns to use his powers quickly, as early as the second story he’s running so fast he can break the time barrier, before long he’s walking through walls. On one hand, this can be read as “new powers as the plot demands”, but since he’s a scientist, it’s expected that he’d know what to do with his powers. This seems to be writer John Broome’s way of avoiding fan letters where people ask “why couldn’t _use his powers to_”. Barry may seem like a boring invincible hero at times, but at least his powers are built up to, explored and re-used so that nothing seems pulled out of nowhere or used only once (remember when Superman could shape-shift?). This makes Barry’s powers actually seem impressive rather than just a case of “eh, it’s a comic book, he can do whatever the plot demands”. 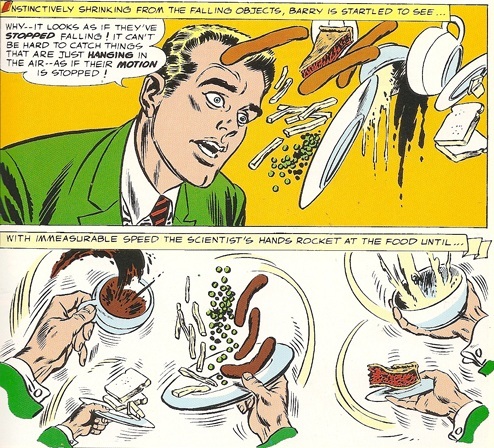 There’s a great scene in the origin story where Barry realizes his powers by seeing falling food in slow motion, it’s a nifty sequence, and logically, that’s how he would see things, even if it begs the question of why he doesn’t see things like that all the time. The stories also try to be educational, and you know what? They aren’t too bad in that regard, facts like the height of the Eiffel tower, or what velocity is, pop up and never once bog the story down, instead they enhance the stories’ entertainment value; for example, the villain Mr. Element’s henchmen are named after the periodic elements (Argon, Krypton). -Iris West, Barry’s love interest, comes off as incredibly unlikeable. I’d have thanked Professor Zoom for offing her, but at least she is shown to be fairly smart and independent in her own way, even if she doesn't consider forensic investigation to be a “real job”. Too bad shows like CSI would take a few decades to come en vogue. From the very first story, it’s apparent her function will be to complain about how slow Barry is and how she wishes he was more like the Flash, with Barry then winking at the reader. While this is the formula sometimes, it’s played with consistently enough that it doesn’t reach “Lois thinks Superman is Clark then decides he isn’t” levels of monotony. -The villains are awesomely inventive and well-used, although Infantino tends to re-use similar costume motifs. Captain Cold is shown to have traces of the sense of honor that would later be made into his defining trait, as he refuses to shoot a guard and tries to avoid harming civilians. Mr. Element/Dr. Alchemy is the closest thing Flash has to an archenemy in this volume, being the only recurring villain and actually being called “archenemy” twice. For someone so inconsistent he’d change his costume and name after just one appearance, he’s a surprisingly formidable adversary and actually does his best to make sure his traps are escape-proof. If you forgive the sheer brazen silliness of his second appearance (he conveniently has a cellmate who has the philosopher’s stone hidden in his apartment drawer), he shows enough promise that it’s a shame he wasn’t built up after this. Instead he just sinks into the background, like the Ultra-Humanite, Hugo Strange, the Vulture, the Owl and other potential/early archenemies who were squandered by dumb writers. Poor guy doesn’t even have a Wikipedia article! Barry Allen’s original arch foe deserves better. With the DC reboot coming up, maybe he’ll have a chance. - Gorilla Grodd is a non-entity. Up until Professor Zoom claimed the title of Barry’s arch-foe by killing Iris, the sporadically appearing evil gorilla Grodd was generally considered the main villain of the series along with Mirror Master. In his debut, he’s a total non-entity; with most of the story being a convoluted mystery over whether or not an actor who plays gorillas is having blackouts where he commits crimes, as well as a subplot about a super-fast car. 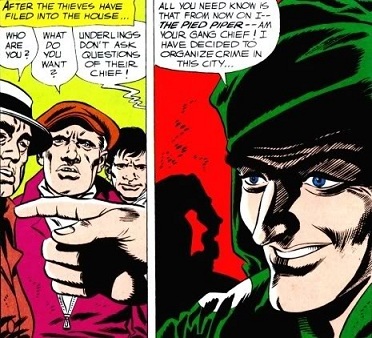 Surprisingly enough, the Pied Piper, who debuts in the same issue and was for years considered a joke of a villain before reforming and coming out (he was easily the best written gay character in comics for years), is a delightfully wicked nemesis, and comes closest of all villains next to Dr. Alchemy in this volume to killing our hero. You’d think that DC, who loved slapping gorillas onto covers in those days, would have given the Grodd story cover-focus, as it’s longer, but Piper wins the cover. He deserves to, his story has a great eerie opening with criminals abandoning their crimes halfway through to answer the Piper’s call, and an awesome scene where he summons a tidal wave from a park pond. Too bad this story is much too short. -The stories come to fall into two categories eventually; Flash fights a menace from beyond, like from outer space, the past, the future or a hidden city. Or he fights an ordinary crook who gains superpowers somehow. Thankfully, each story is handled uniquely, all of them are worth a read, and while only a handful struck me as excellent, only the debuts of Mirror-Master & Grodd struck me as actually bad. So all in all, these comics are as good as you can get (without getting too good) when it comes to superhero comics from a simpler time. I recommend this tiny Chronicles edition because it’s a great sampler; you can decide for yourself about the quality of these stories and if you want more, rather than getting the huge Showcase edition and being swamped with tons of stories you may hate. The charm of these stories is most apparent in small doses. Also, if you’re adverse to the Silver Age but want to read these stories, I’d recommend not trying to read this whole thing in one sitting like a modern graphic novel.